Abscess of the tibia; resection of the knee-joint; amputation; recovery. Journal : Australian Medical Journal ; n. s., vol. vii. Melbourne : Stillwell and Co., 1885. Description : 252-254 p. [1 l. pl.] ; ill.: 1 phot. ; 23 cm. Photographer : Imperial Photographic Company. Subject : Tibia — Amputation. Author caption: By J. H. WEBB, M.R.C.S. Eng., L.R.C.P. Lond. Surgeon to the Melbourne Hospital. 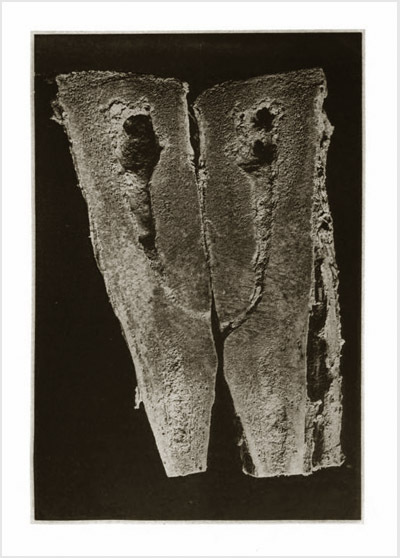 Examination of a longitudinal section, through the tibia, revealed the presence of an unsuspected abscess cavity, having the appearance shown in the accompanying photograph (executed by the Imperial Photo Co.) — page 254.